Try as we might, we cannot ignore the tumultuous relationship that exists between “the Lord” and the humans throughout the book of Genesis. Routinely, the humans make propositions in order to prevent an undesired condition, and God responds by forcing the unwanted condition upon the humans. 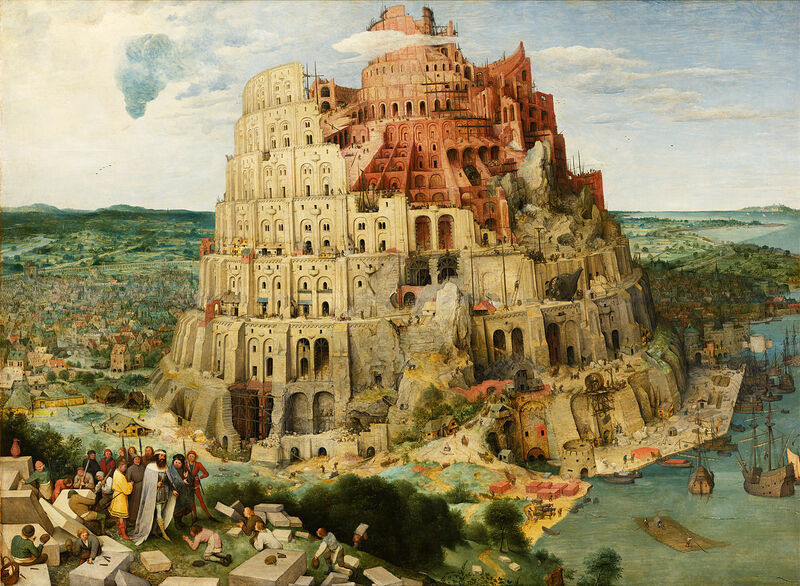 Consider the story of the Tower of Babel found in Genesis XI. All the earth has become one single language -a phrase echoed five times in the story. In a post diluvian world, the humans have moved from the east, presumably to the west, in order to settle in the valley of Shinar (Northern Babylonia). Utilizing new technology, namely brick and mortar rather than stone, the humans make a proposition. They propose to build a “city” and a “tower” with the intent of making a name for themselves, and also to prevent them from being scattered throughout the earth. The humans are concerned with greatness. They long to transcend their current condition by forming a city, whose tower reaches into the heavens. They are also concerned with endurance, not unlike Gilgamesh who faces a forgotten legacy when many people do not recall the time before the great deluge. They want to endure, because it is powerful, and the way to accomplish this is through politics, or the acts of the body politic. The Lord comes “down” to the city to discover its dangers. If the humans create a city as they propose to do, they will be able to do anything. They will become proud and confident. This prospect is particularly threatening to the Lord. He beckons “us,” perhaps referring to multiple deities, to go down and baffle their language so they will scatter throughout the earth. It is a reminder of God’s prohibitions to the humans in the garden of Eden in Genesis. Recall that he does not want the humans to eat of the Tree of Knowledge, Good and Evil, for they will surely die. In order to prevent the humans from achieving greatness, He must confuse them. Thus the need for the Lord to confuse the language, balal in Hebrew like the word babble in Akkadian. It might be said that the Lord finds His authority in direct contest with the humans’ desire to form a city. The shepherd longs to control and regulate the human beings because they cannot be trusted to rule themselves. Human greatness and pride is a challenge to God, and therefore He finds himself in conflict with the humans, opposing their will to power.